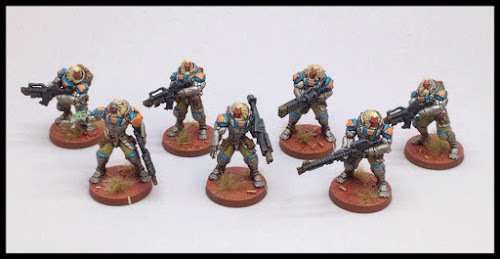 Hello dear readers :) I went on a bit of an Infinity binge awhile back and bought up a whole Morat sectorial (all the new sculpts anyway). They have been staring at me accusingly from my display cabinet for quite a long time now and I finally decided to start painting them, as a rough colour scheme had slowly evolved in my muddled brain. To begin I went with the basic grunts of the force, the vanguard infantry. While not very good particularly in game they are lovely models, and were a real pleasure to paint. Corvus Belli have really upped their game on the more recent sculpts, and these were no exception. I wanted to do a scheme that was pretty simple to do, and did not involve many processes. My hope was that I could knock them out pretty quickly, mainly using drybrushing and washes to achieve as much of the shading and highlighting as possible. These were not going to be to a standard I tried for my Japanese, but more tabletop, so I skimped on alot of areas to speed up the paint job. The base of the models were sprayed silver, then given a wash of nuln oil. After this I drybrushed with mythril silver on all the armour plates and did an agrax earthshade wash to blend everything together and dirty it up a little. The trousers were painted gretchin green, washed with seraphim sepia, then bought back up to base green again, with a final highlight of bleached bone mixed into the green. The guns were all simply drybrushed with 2 stages of grey, then washed all over with nuln oil to blend it back to black again. It was at this point they were looking a little dull so I decided to add some colour on the shoulder guards, shin pad surrounds and top chest plate, and I chose the turquoise and orange as they compliment each other nicely. Again these were simply washed and then re-highlighted the same way as the green. I decided to stick with the fluff and go with the red faces of the monkeys, and felt that a sandy hair colour would set everything off nicely. Overall I am really pleased with the scheme, and it was refreshing to be able to paint quickly using mainly drybrushing and washes for large areas, and more simple highlighting (I say quickly, as they still took a while, but nowhere near as long as my Japanese sectorial models). I really like the paint scheme. Between the drab/dark clothing and weapon bits, and the splash of blue and orange they look like the near future warriors of Infinity. I also like the bases, the Martian earth is a cool paint, and done here it really sets off the mini. Originally I was not going to use any colour apart from a touch of orange, but the whole model was far too drab, so I experimented with the colours and these two worked very well together. Really pleased with the basing. Such a great paint the Martian one and really easy to do. Saved me a ton of hassle and money by doing them this way jnatead of resin basing. Big fan of these guys. Nicely done. No real critiques on them, other then possible a bit of highlight on the heads to pop them a bit more. (maybe some orange?) I do see some good highlights, so that could also just be them being washed out a bit in the lighting! I quite like the bases as well! Totally agree on the highlights. They were orange ones done on them but they have got dulled down by the wash way too much. I think I will go back and touch them up so they are brighter.